While the game is rapidly shaping up, my ‘todo’ list continues to grow. The doors have become a pivotal part of the game, but due to the amount of detail in the structures selection can be an issue. I am currently working on improving the selection system, but to avoid having to select doors themselves I have simply detected when a player fires a weapon into a nearby door. 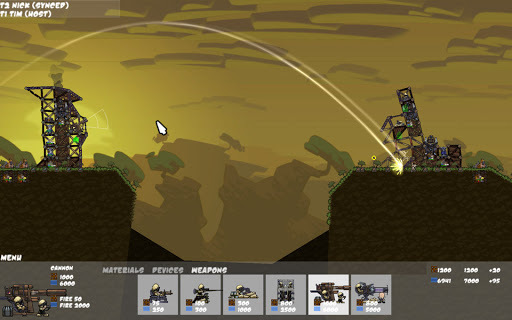 The game automatically opens the door, assuming the player wants to fire through it. It makes surprising your enemy that much easier. Closing the door is left up to the player. An absent mind can leave your weapon and the inside of your fort exposed to enemy fire. You can currently left double-click on a door to open or close it. Damage to the structure now affects how the materials look. Holes are punched into your struts as they take more hits, giving you a visual cue of the most vulnerable parts of your fort and where to concentrate your repair effort. Smoke also billows from heavily damaged weapons. Devices – which include weapons – are now unable to be built on top of bracing, armor, solar panels, etc. You can place them on top of the fort, or inside – with the help of the ‘background bracing’ material. Feedback is now given to show you what’s stopping you from building in a particular location, but more work needs to be done to inform the player and reduce frustration during construction. There are now key bindings to select the next weapon, and the next weapon ready to fire. In combination with the auto-doors it is much easier to manage large numbers of weapons. Another play session last night with Brian was good fun and the game was stable (screenshot below). Early in the game he smashed the top of my fort with his mortar. Having survived that I had two mortars built behind my fort peppering the base of his. I also had a cannon punching holes in the middle.